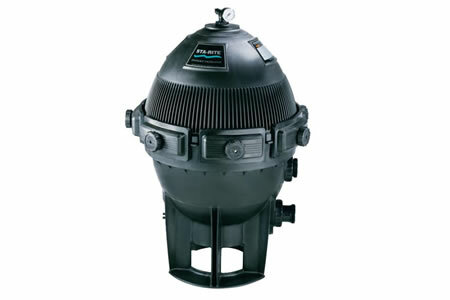 HAYWARD SWIMCLEAR 325 SQ FT 2″ CLUSTER FILTER (4) – Utilizing a cluster of four reusable cartridge elements, SwimClear filters offer a choice of 225, 325, 425 or 525 square feet of heavy-duty dirt-holding capacity for extra-long filter cycles, up to an entire season without cleaning. With filter tanks constructed of improved PermaGlass XL® material, SwimClear filters will provide years of trouble-free operation and crystal clear, sparkling water. 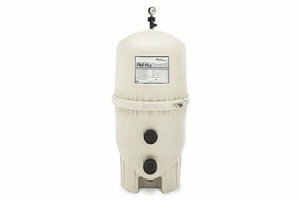 PENTAIR CLEAN Š CLEAR PLUS 420 SQ FT CART FILTER – Looking for top-end filter performance with the lowest maintenance? Look at a cartridge filter. 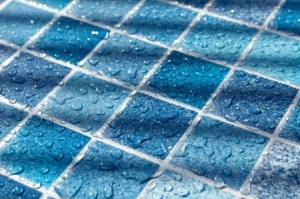 This long proven design uses special filter elements to strip particles from pool water with great effectiveness… particles as small as 10-25 microns in size (particles smaller than 40 microns cannot be seen by the human eye). Maintenance? Open the top. Remove the cartridge. Hose it off. That’s it. STA-RITE SYSTEM3 400 SQ FT INGROUND POOL FILTER – With a Sta-Rite modular media filter, you can avoid the headache of frequent, complicated pool maintenance. Through innovative design and a unique filtration concept, System 3 Mod Media delivers the dirt-handling capacity that out performs all other similiar-sized filters.